"He’s the biggest star at a time when there aren’t as many who can carry a movie globally." Hollywood plays by new rules. If a studio wants to score a big hit in China, home to the fastest-growing box office on the planet, it needs a globally known brand like Marvel. A-list stars, once the anchors of the industry, don’t necessarily draw overseas audiences by their names alone. But there is at least one big exception — Dwayne "The Rock" Johnson. 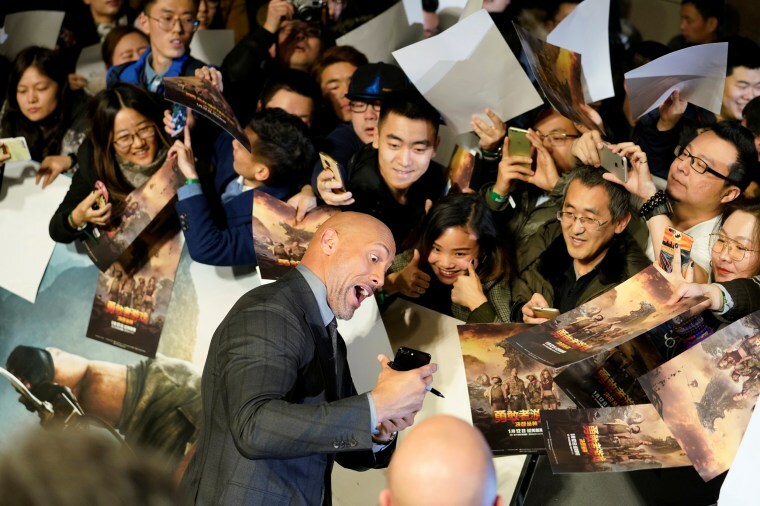 In the last decade, the former professional wrestler has become one of the most popular and consistently bankable American stars in China, a brawny and exuberant leading man who powers hits like “San Andreas,” “Rampage,” and the “Fast and Furious” sequels. Johnson’s rise comes as the American film industry — confronted with tepid domestic theater attendance and rising ticket prices — increasingly places its bets on China, with its 1.3 billion people and more than 40,000 big screens. “The overseas numbers show that he’s become such a dominant force — even just having his name above the poster,” said Jeff Bock, a senior analyst at Exhibitor Relations, an entertainment research firm. “He’s the biggest star at a time when there aren’t as many who can carry a movie globally,” Bock said, adding that some of Johnson’s projects — like the last two installments in the “Fast and Furious” saga — exceeded their domestic grosses by tens of millions of dollars in China. “Rampage,” the recent sci-fi monster film in which Johnson plays a primatologist who teams up with a mutant albino gorilla to protect Chicago, is just one example. It grossed a respectable $99 million in the U.S. in April, but it soared to more than $156 million in China, earning a spot on the top 10 highest-grossing movies of the year there to date. The film, a $125 million riff on “Die Hard” that was partly shot in China, stars Johnson as a former FBI agent and amputee who must defend Hong Kong’s tallest skyscraper against a band of terrorists. “Skyscraper” will be released in China on July 20, a notable release date as it comes amid the government’s so-called blackout period, when Hollywood imports are barred from theaters and Chinese productions are given a chance to flourish. One reason for the prime spot on the calendar: “Skyscraper” is co-produced by Legendary, a California-based production company that was acquired by the Chinese conglomerate Wanda Group in 2016 and boasts major marketing muscle. “It’s pretty significant that ‘Skyscraper’ is the lone Western film showing in China during a six-week period, spanning July and early August, when [middle-class consumers] go out in droves,” said Richard Gelfond, the chief executive of IMAX. Johnson, for his part, owns up to the raw commercial calculation behind “Skyscraper,” which debuts on Friday in the United States. “The studio immediately saw the business end of it. China will probably overtake the U.S. as the biggest market in the world in the next 24 months,” Johnson recently told The Los Angeles Times. Hong Kong is just one of the Chinese cities Johnson has evidently come to know well. He has repeatedly toured the country for public-relations blitzes, posing for selfies with legions of adoring fans and gamely taking to the stage for family-friendly press junkets. “He’s worked hard at building a profile in China, as some but not all American stars have, and he’s made himself extremely accessible,” said Stanley Rosen, a professor at the University of Southern California who studies Chinese cinema. Johnson’s all-smiles social media footprint — 110 million followers on Instagram, 13.1 million followers on Twitter — doubles as a colorful Chinese travelogue, brimming with photos of the beaming, unabashedly giddy star mixing it up with locals on the streets or at jam-packed red carpet premieres. Of course, Johnson still has celebrity status in the United States, where he commands the sort of media attention and loyal following that inspired feverish chatter about his long-term political ambitions. And yet Johnson dispelled those rumors, telling Vanity Fair this week that he had ruled out a 2020 presidential run.